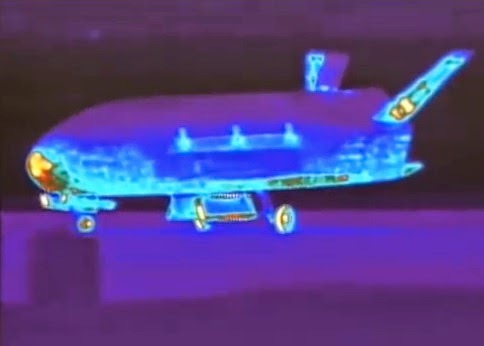 X-37B landing in 2012. Credit: USAF video still. VANDENBERG AIR FORCE BASE, California -- The X-37B Orbital Test Vehicle (OTV-3), the U.S. Air Force's unmanned, reusable space plane, landed at Vandenberg Air Force Base at 9:24 a.m. (PDT) on October 17, 2014, officials reported. The OTV-3 launched from Cape Canaveral Air Force Station, Fla. on November 27, 2012 and spent 674 days in space conducting a secret military mission before returning to Earth. The X-37B program are the only re-entry spacecraft the U.S. launches since the retirement of the Space Shuttle fleet. OTV-3 was a re-flight of OTV-1 launched in April 2010 and recovered at Vandenberg AFB Dec. 3, 2010 after 224 days on orbit.